Knowing fully well that the protectiv magic Celestia had cast upon her with her dying breath would only last so long, the pegasus had only one choise. She would have to fly faster than she ever had, far beyond what would create a sonic rainboom. Most likely it would end her own lifespan the moment the impact was made, but it ... it might just do it. Without saying a word the blue pegasus looked down at her friends, Twilight ... exausted from fending of the monsters that came with the night after Luna had been killed, Cadence, broken and crying over Flurryheart that had since loong stoped breathing in her arms. Then there was Pinkiepie ... how long had it been since she stoped truley smile? How loong had it been since that pony had truley laughed? To long to remember, but she always gave a smile to others, somehow wanting to give hope when there was none. Rarity, oh sweet rarity, how far had she not fallen? The mare had given everything she had in the last battle, loosing both her eyes, a ear and a hoof all to protect some ponies she had never seen even once. Applejack, strong, stubborn applejack ... When ponies falterd she was there, suporting them, as they fell asleep for an eternal night she was the last to leave their graves, as applebloom had joined the masseds of dead she had said nothing, done nothing, just stood there, staring at the grave in complete silence. And then there is her oldest friend. The kind one, the gentle and fragile fluttershy. With wounds all over her body, barley breathing as it was and only tears in her eyes, no hope, no love nor compassion. Only pain. How could this have happend? How could this all have happend? They had four adult alicorns to fight and protect equestria yet it all fell, it all just ... disipeard. Slowly the blue mare lifted her head towards the sky and the sun that would set for the last time. As she watched it under her rainbow coloured bangs she slowly closed her purple eyes. As she closed them she flapped her wings as hard as she could, eventually creating a sonic rainboom that spread not just across the closeby lands, but all of equestria. This is her battle, this is her time, this is her last moments alive and she does not intend to go out without a fight! 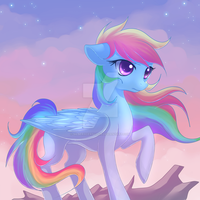 The rainboom spread across all of equestria, and with it her own hopes and dreams. If she had only been able to join the wonderbolts, to hug her friends and family one more time. If she could just ... no. Right now Equestria needs her! If her sonic rainboom could help anypony then so be it! If it could spark even the smallest of hope, of faith and trust, and even maby friendship in equestria then that is her finall gift! As the air got to thin for the mare to breath she pulled her wings into her body, falling back down towards the ground. The rainbow trail behind her slowly turning to pure energy and fire. Halfway down she spread her wings once more, taking off straight into the sun. As she touched the surface the spell broke, and the last thing she could feel was the heat, the last thing she said however was "I will wait for you" in a weak whisper as her body was evaporated by the sun as the two colided. Man finally someone with good art!! It reminds me of the battle Phosphora vs Thanatos in Kid Icarus Uprising. THIS ART WAS PUT IN A PUZZLE MLP GAME!!!! I love your art!!!! It's so awesome!! HAH. I wish I could do something this incredible in a "quick draw"
This... picture... is so AWESOME! Please tell me you do commissions? I would GLADLY pay you to draw something as awesome as this! Genial!! Se ve hermosa y fuerte!! Don't think she would be happy to hear that. To get results in seconds instead of hours just follow three simple steps. Drag and drop image to your desktop to save it, go to google images, drag and drop image into search bar. Searching that way brings up all the websites that are currently hosting that image. I have no idea what's going on here... but it looks totally AWESOME!!! It reminds me of that Pokemon movie. But this is still a really cool picture though! This is well done, high detail.